This weekend Holland commemorates the 201st anniversary of the landing of William, the first King of our monarchy. 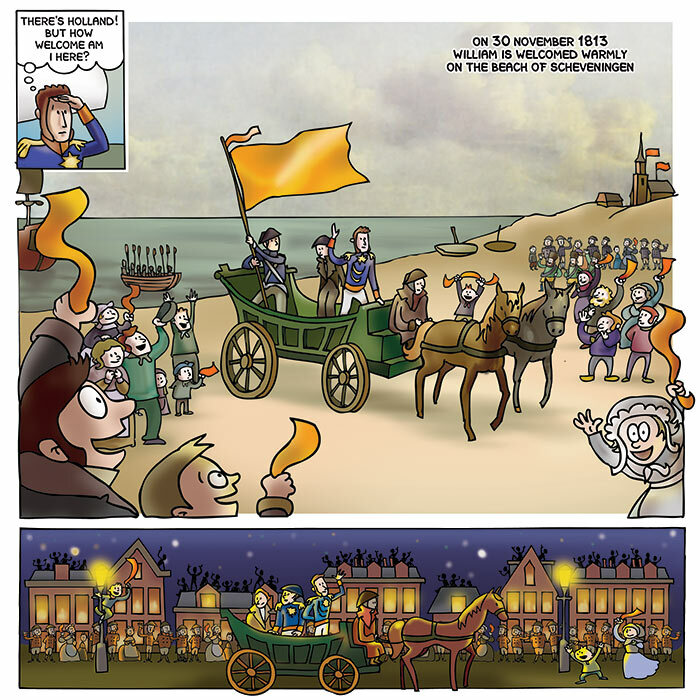 Each year, this landing is re-enacted on the beach of Scheveningen – William arrives by boat from England, whence he was summoned to rule the newly “liberated” Netherlands (although some of the French occupants were still in the country at that time). It was a daring, risky enterprise, which turned out extremely well: most of the Dutch people (well orchestrated by politician Van Hogendorp) were ecstatic to have the old power back and embraced William and his family as their new royal house. People even stood on the roof to cheer their new ruler as he rode into The Hague! This comic is part of a travelling exhibition, initiated by Museum Meermanno. The exhibition consists of ten panels, telling the history of William I in comics (by me) and adjoining texts (by Marc Kleijnen). The exhibition can now be seen for free in the library of Heiloo. Ik dacht dat dat de boot van sinterklaas was! Previous Previous post: Run, Dad!